Excluding large allocation from Hayman, Financials saw a -2.0% decline in sector exposures. Low rates and mortgage related put-back problems in Financials may have led managers to trim and exit positions within the space throughout 2011 and into 2012. We found a majority of hedge funds largest positions were shared amongst the hedge funds in our universe. 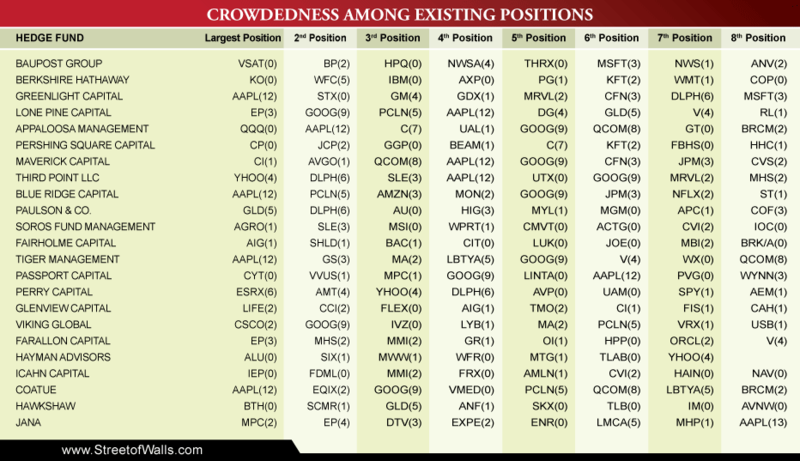 AAPL was by far the most crowded position in the top 12 holdings for hedge funds: Greenlight, Lone Pine, Appaloosa, Maverick, Passport, Blue Ridge, Coatue, and Tiger all have Apple Inc. (NASDAQ:AAPL) as one of the largest position in their holdings. Other large crowded positions include GOOG, (NASDAQ:ESRX), Delphi Automotive PLC (NYSE:DLPH), QUALCOMM, Inc. (NASDAQ:QCOM), and Citigroup Inc. (NYSE:C). On average the funds listed below bought companies with a 2012 forward price to earnings ratio of 17.5x vs 18.6x last quarter. Appaloosa and Viking bought into the higher valuation stocks at 47.4x and 27.9x respectively while Glenview and Hayman bought into much lower valuations at 12.4x and 11.8x respectively. Introduction on 13F Filings: Registered hedge funds over $100 million are required by the Securities and Exchange Commission (SEC) to file quarterly updates on portfolio holdings. These holdings are filed online through form 13-F at sec.gov. Hedge funds are required to file these holdings no later than 45 days after the end of the calendar quarter. 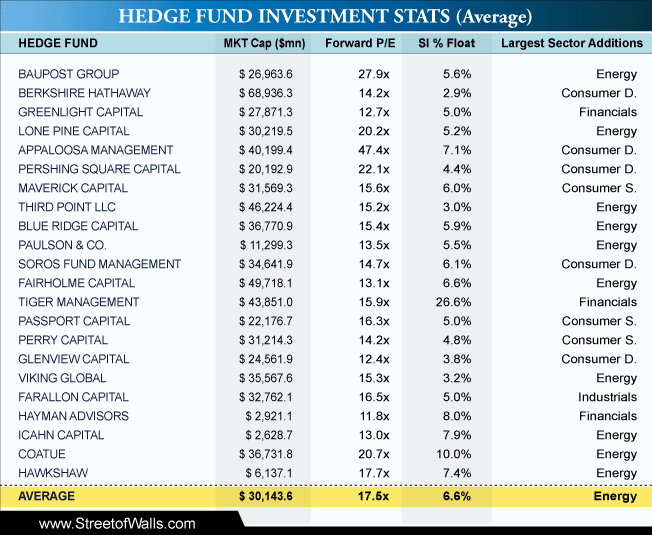 The Street of Walls team compiled very detailed analyses on 20 of the top Hedge Funds in the industry. 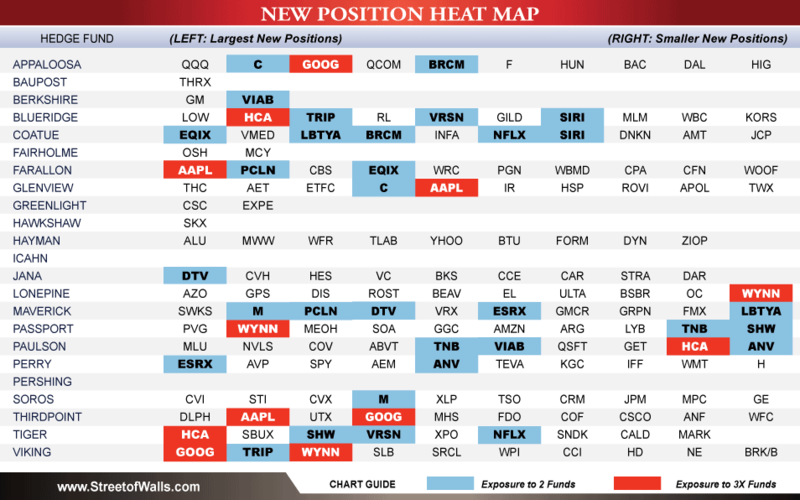 This report focuses on hedge fund positions at the start of 1Q 2012 and looks at meaningful changes from the previous quarter. The report is based on 22 of the top hedge funds.